Boating is a major passtime in the 1000 Islands. And even if you don’t bring your own boat, you will definitely want to spend some time on the water with your own marine adventure. 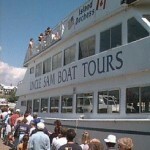 Each side of the international border along the St. Lawrence River offers its own unique view of the 1000 Islands Region, and each of the several boat tour companies on each side offers a variety of tours. To get the most of your Thousand Islands vacation experience, we recommend you travel with several different thousand islands boat tour companies, at least one from each side of the border. Both sides offer dinner cruises. Sunset on the Saint Lawrence River is an experience no one should miss. You’ll find sheltered areas suitable for exploring by canoe or jet ski along both coastlines, but realize that the shipping channel through the river is heavily traveled by huge ocean-going cargo vessels, and can be treacherous for such small watercraft. The entire region is extremely popular among all manner of boaters, from small bass boats trolling for fish, to sleek cigarette speed boats that churn up the waters during the annual poker run. The 1000 Islands Region offers border crossing by ferry boat and three international bridge systems. The eastern-most bridge is between Massena, New York, and Cornwall, Ontario. There is another between Ogdensburg, New York and Prescott, Ontario. But the most traveled bridge route is between Alexandria Bay, New York and Gananoque, Ontario. There is also a ferry boat crossing between Cape Vincent, New York, and Kingston, Ontario. Following are the best boat tours and marine adventures in the Thousand Islands Region.